Are Your Android & iOS Apps Safe? Whether it is Android or iOS, App Security is a lesser priority aspect in mobile app development for developers. It is because of the time pressure during the development phase. App security doesn’t get what it deserves in the project process. Additionally, if there is no security owner in the development team, nobody truly takes responsibility. It is because of this reason that app security, regardless of the platform, is a matter of priority of mobility service providers. Mobile app security and usability are two of the concepts that are in inverse relation to each other. Highly secure app solutions require a lot of processes and flows. But, most of the businesses that work directly with consumers do not consider app security their prime preference. Practically, app owners or developers do not consider security a threat until unless something goes wrong, like hacking. Almost every mobility service provider company in India does not take care of definite Android and iOS security tests. Apps are big targets for malicious activity. According to a report, 90% of the applications have at least one issue that is not covered under Open Web Application Security Projects. And 49% of the tested applications have a critical or a high severity weakness. It is also reported that 50% of the organizations haven’t allocated any capital toward mobile app security, making it the most significant disadvantage when considering mobile app threats. Transferring malware in the apps and further into devices, making the data accessible, storing the keystrokes, and getting into passcodes. Tampering the code of the app and reverse-engineering the app’s functionality. Stealing customers’ data for identity theft and frauds. Getting hold of the private business assets. Accessing the IPs and the organization’s back-end network. And the customers expect apps to be secure, and it won’t prove to be good for businesses if taken granted. For the kind of apps that deal with a large number of data or have complex compliance requirements, for businesses like healthcare and finances, this is true. 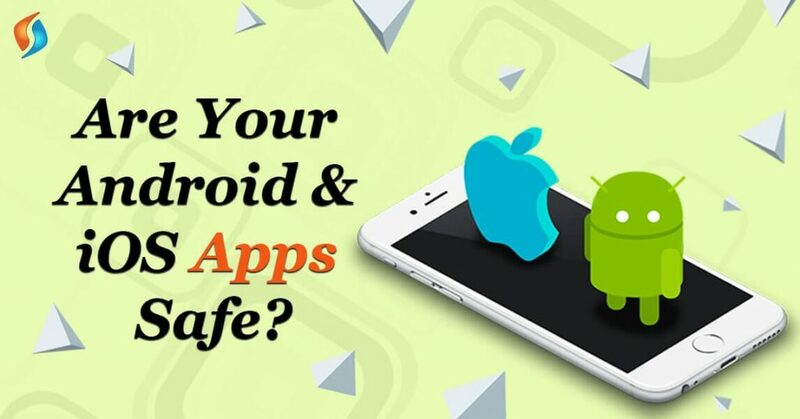 If you are getting your mobile app development done – whether it is for Android or iOS app development in India, the chances are that you have not thought of securing your app, your organization’s data, or customer’s data. A mobile app can be self-sufficient to do its security work if there is – the software code, databases, back-end network, APIs funneling data, the devices, operating system, and the user. Every aspect plays a vital role in the app security play-off. And the organizations with mobile apps in a competitive market, clinging for robust security could be a big differentiator. Native apps are very different from web applications, where data and software exist on a server, and the client’s end is just an interface. While, native app’ code resides on the devices, making it more accessible to the hackers. Protect your app with encryption. Make your code a secret and hard to read. For this minification and obfuscation are the common ways, along with this stick with well-supported algorithm coupled with API encryption. Make your code as agile as possible. You do not want your users to stuck without an update after a breach. Test your source code for vulnerabilities. Cloud and servers should have added security measures in order to protect the data and prevent unauthorized access. Create encrypted containers for securely storing your data and documents, known as Containerization. Database encryption and encrypted connection with a VPN, adds extra security. Federation is a next-level security measure in which the resources are spread across servers with their separate keys. Authentication and authorization help an app prove to the users that they are an addition, adding another layer of security to the login process. Ensure that the APIs you are using provides access to the parts of your app that will minimize vulnerability. Install the OAuth2 framework. It will work on your authorization server and customizes it according to your need for enterprise mobility solutions. Moreover, it allows you to grant user permissions between the client and end users by collecting credentials. JSON web tokens will help you in encrypting data exchanges, ideal for mobile security. Open ID Connect allows users to reuse their same credentials across multiple domains with an ID token, so they do not need to register and sign in at every point. Mobile app’s code and data are stored on devices with a traditional web application for accounting the different bandwidth, performance, and quality of devices. Because storing locally on a device makes the data more vulnerable and leaky apps can release customer data without the user knowing about it. Stick to file-level encryption to encrypt at-rest data so it cannot be read if intercepted. Develop mobile apps that do not store sensitive data of the customer like bank account details, passwords, credit card information on devices. And if they do store make sure it is secure and follow encryption. Testing your app’s code is essential in the app development process. When examining the functionality, our iOS and Android app developers in India, test the code for security. If there are vulnerabilities, we correct the code before publishing it. Test your code thoroughly for authorization and authentication, data security issues, and session management. Also, test your app’s performance in a simulated environment. We are the best mobility service provider in India! With the threat intensifying in the app development, your app needs to stand safe from these potential attacks. We at Signity, a leading name in the field of the mobile app, custom web development in India, can help you accomplish safe mobile app development. Our team has been helping businesses all around the world to develop the most amazing mobile apps. Thus, with a robust mobile app development strategy developed by our expert iOS and Android app development services in India, we can provide you with a top-notch mobile application for a secure and growing business. Signity has an in-house team of expert coders, programmers and developers to handle any app development requirements. So, get in touch with our IT outsourcing services now and let us take your business to new heights. Contact us now.